It’s always sad to lose your best player, with Juan Mata having been voted as such by Chelsea’s fans and players for two years running. The Spaniard is known to be popular with the board, happy in London and loyal to the club. The sole reason for the 25-year old’s departure is Jose Mourinho. You could say the £37 million is a huge contributing factor as it’s an offer to good to refuse but United would simply not be bidding on the playmaker if he were in the Portuguese’s plans. The fact is that Chelsea is winning matches without him. Mourinho has proven that he can contest for the title where predecessors couldn’t without even playing the man that was deemed to be their strongest asset; something that he is likely to take real pleasure from. The primary reason that ‘The Only One’ has given for dropping the former Valencia man is a lack of defensive contribution, or at least in relation to what he demands from his players. In Mourinho’s eyes Chelsea had two luxury players, Mata and Hazard, and in his system there is only room for one. 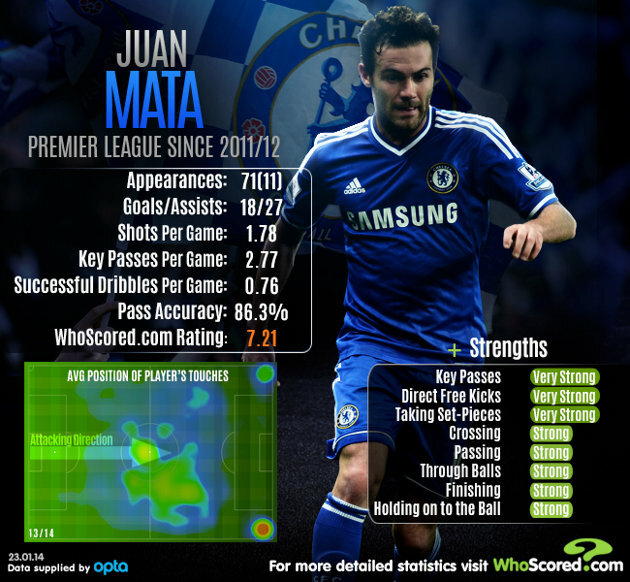 Player characteristics show that both Mata and Hazard have ‘defensive contribution’ as a weakness. Meanwhile, Oscar’s defensive contribution is ‘strong’, while Willian’s is statistically ‘very strong’. Mata has been on the fringes of the Chelsea side this season, featuring only 13 times in total in league action, and is clearly not part of Jose Mourinho’s first-team plans. Mata doesn’t make up defensively for his attacking prowess, the balance of both being something Mourinho teams have always strived for. Hazard is undoubtedly Mourinho’s luxury, while Oscar and Willian are being tasked to allow the Belgian to flourish. It’s worked, and he’s done exactly that.Angel Di Maria played a similar role under Mourinho at Real Madrid. A tireless runner, Ronaldo’s need to track back was lessened by the Argentine’s work rate on the opposite flank. You could argue that the Spanish giants had two luxury players in Mourinho’s attacking midfield, with Ozil playing in behind the striker, but the manager has been quick to talk up the competitiveness of the Premier League in comparison to the ‘two-team’ La Liga at the time. The Chelsea boss is clearly looking to press high up the pitch when possible, but also have more solidity to the side; a lack of which he may have felt cost them in recent years. Chelsea fans can be as heartbroken as they like, and they will be, but £37 million for a player that is surplus to requirements under a man that they were desperate to return is an incredibly good deal. Ideally you don’t want to sell to a club that, despite an awful campaign thus far, will likely still challenge for honours in the coming years, but there really isn’t any side outside of England that will pay that sort of money right now. United are in somewhat of a desperate situation, and one that Chelsea are probably right to exploit. 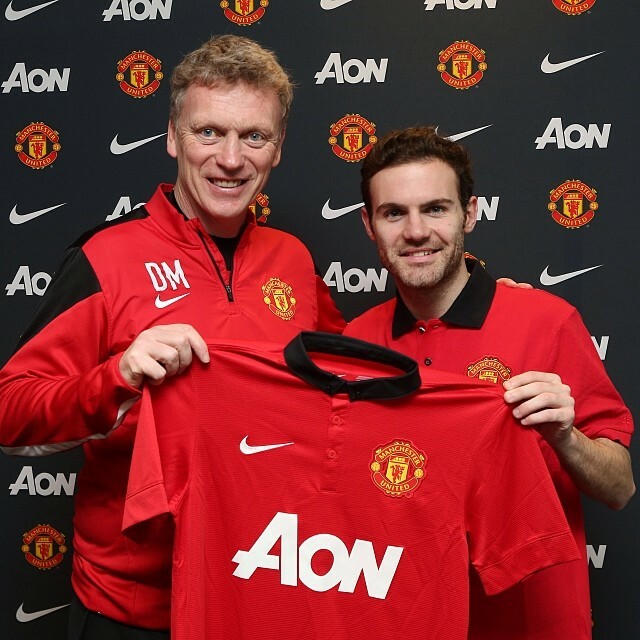 They need to rebuild and plan for the future in a time when key players may well see their own away from Old Trafford. Signing Juan Mata, if both Rooney and Van Persie stay beyond the summer, would certainly seem to make little tactical sense. Any formation involving all three would surely see a lack of wingers, while Moyes favours attacks down the flanks. Indeed, no side has focused fewer of their attacking touches down the central third of the pitch than United this season (24%). It’s in this area where they’ve lacked creativity, however, with just 4 assists coming from wingers in the league thus far this season (Januzaj 2, Valencia 2). Meanwhile, Wayne Rooney, who has played in behind the striker more often than not, has 9 assists – three times the amount of any other teammate. 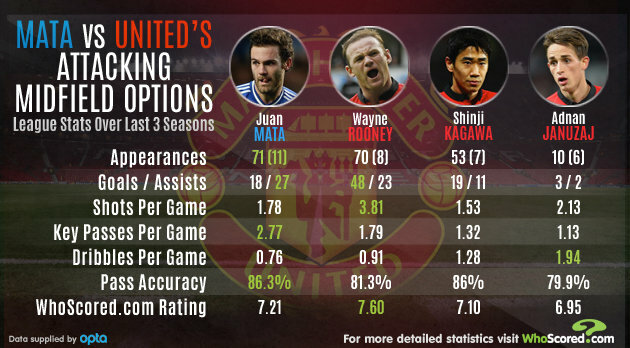 Mata is a superb player, there’s no doubting that much. Since he arrived in England only compatriot David Silva has picked up more assists and created more chances in the Premier League than Mata’s figures of 27 and 227 respectively. He can unlock a defence like few others in and around the box, but United will need to have a change in style if he was to do so to the greatest possible effect at Old Trafford. The reigning champions would unquestionably be strengthening their squad by signing the 25-year old. They’ve also given Chelsea a huge sum of money for a player on the fringes of the side, with which they can improve their team greatly where necessary. United fans will be delighted at the prospect of seeing Mata in red and Chelsea’s faithful shouldn’t be feeling too blue over a deal that is certainly right for them at this moment.